I can’t wait for you to see this issue. It’s pretty cool. This month we continue our series of looking at the hotels at Walt Disney World by their location. 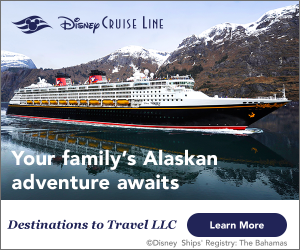 We started out a few months ago with the Magic Kingdom Area Hotels. This month we are looking at the Epcot Area Hotels. I think you’re really going to enjoy this. 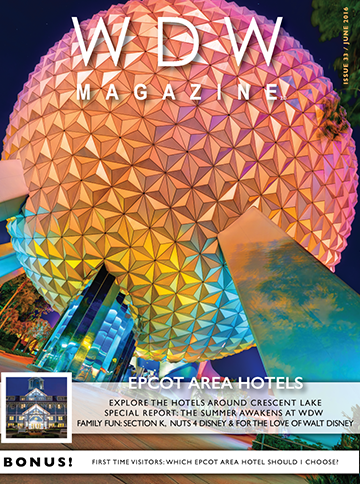 The feature articles this month focus on the hotels in the Epcot Area. We start out with a look at Disney’s beautiful Yacht Club Resort, followed by it’s sister the Beach Club Resort & Villas. Then we skip across Crescent Lake over to the BoardWalk Inn and Villas and yes, we even look at the Swan and Dolphin resorts. Dave kicks off Helping Hands with a look at which Epcot Area Hotel works best for first time visitors. Kathleen talks about how hurricane season at Walt Disney World. A very important topic. In our Scrooge or Splurge we look at the pros and cons of staying in an Epcot Area Hotel, then Amy takes a lovely, morning walk on the BoardWalk. Our Best of WDW attraction this month is Illuminations: Reflections of Earth a great show, Tiffany gives us 10 reasons to love Disney’s Beach Club Resort, Ryan talks about the Yachtsman Steakhouse, ooooh, yum! Want to smell good? Stephanie take a look at the Basin shop and the Basin White shop. Wally D takes a trip to Epcot this month and that kicks off Section k! The Park kids take Takashi over to the Japan Pavilion. James and Lisa start a series on runDisney training for the whole family and of course we have our coloring and game downloadable pages. The FanZone kicks off this month with our Questions of the Month results. Looks like the Beach Club is your favorite. Cindi shows us how to make a Chickpea salad like the one seasonal offering from Harambe Market. Our Vinylmation Corner looks at Epcot Vinylmations and in the Tsum Tsum Corner we see Duffy the Bear Tsum Tsum’s. Wow. How cute. Summertime is here. It’s June and that means it’s summertime at WDW. Sarah looks at the summer happenings around WDW and we have a sneak peak at the delayed Rivers of Light and the Tree of Life awakening as part of the summer happenings at WDW. This month we have a very special extra. We love helping people out and that is the focus of DreamBuilders Foundation. This month we interview Misty Griffin who is the founder of DreamBuilders. They help parents struggling with terminal illness have one last memory-building experience with their families. You have to see this. There is lots of news this month to get us started going Around The World. Then Terri has some very Fun Facts about Disney’s Frozen (not the movie) Treats. Now that’s just cool! Have you every wanted to learn how to surf? We’ll you can at Typhoon Lagoon and Mike tells us all about it. Kim take a look back at Journey to Imagination with Figment in our Gone but not Forgotten. Then Joe takes us outside the “world” to head over to Madame Tussauds. Another jam packed issue. What are you waiting for?